Jonathan Fishman, Robin Youngs, Edward Fisher, Musheer Hussain,	The Journal of Laryngology & Otology, Volume 130 Issue 12, pp 1075-1076. Ó Gilheaney, P Kerr, S Béchet, M Walshe,	The Journal of Laryngology & Otology, Volume 130 Issue 12, pp 1077-1085. A Mudry, W Lübbers, W Pirsig,	The Journal of Laryngology & Otology, Volume 130 Issue 12, pp 1086-1092. The Journal of Laryngology & Otology, Volume 130 Issue 12, pp 1093-1097. M Stavrakas, P D Karkos, K Markou, N Grigoriadis,	The Journal of Laryngology & Otology, Volume 130 Issue 12, pp 1098-1102. Can curcumin modulate allergic rhinitis in rats? M Acar, N Bayar Muluk, S Yigitaslan, B P Cengiz, P Shojaolsadati, H Karimkhani, S Ada, M Berkoz, C Cingi,	The Journal of Laryngology & Otology, Volume 130 Issue 12, pp 1103-1109. C Galy-Bernadoy, M Akkari, M Mondain, A Uziel, F Venail,	The Journal of Laryngology & Otology, Volume 130 Issue 12, pp 1110-1114. A Yenigun, M E Ustun, S Tugrul, R Dogan, O Ozturan,	The Journal of Laryngology & Otology, Volume 130 Issue 12, pp 1115-1119. M Mahajan, J S Thakur, R K Azad, N K Mohindroo, P C Negi,	The Journal of Laryngology & Otology, Volume 130 Issue 12, pp 1120-1124. S Haft, R M Carey, D Farquhar, N Mirza,	The Journal of Laryngology & Otology, Volume 130 Issue 12, pp 1125-1129. M T Egeland, M Tarangen, C Gay, L K Døsen, R Haye,	The Journal of Laryngology & Otology, Volume 130 Issue 12, pp 1130-1136. K G Effat,	The Journal of Laryngology & Otology, Volume 130 Issue 12, pp 1137-1141. ML Magdalena, A Solé, V Blanco, JP Rodrigo,	The Journal of Laryngology & Otology, Volume 130 Issue 12, pp 1142-1146. A Honma, D Takagi, Y Nakamaru, A Homma, M Suzuki, S Fukuda,	The Journal of Laryngology & Otology, Volume 130 Issue 12, pp 1147-1152. 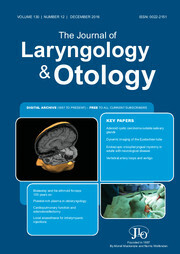 N Ata, O Erdur, M H Görgülü, E Yilmaz,	The Journal of Laryngology & Otology, Volume 130 Issue 12, pp 1153-1157. P K Foster,	The Journal of Laryngology & Otology, Volume 130 Issue 12, pp 1158-1161. N Jufas, N Deveau, M Bance,	The Journal of Laryngology & Otology, Volume 130 Issue 12, pp 1162-1164. K Padmanabhan, D T Pulimoottil,	The Journal of Laryngology & Otology, Volume 130 Issue 12, p 1165. A Mudry,	The Journal of Laryngology & Otology, Volume 130 Issue 12, p 1166. M Mulheran, N Wooles, P Bray, M Brewster, A R Banerjee,	The Journal of Laryngology & Otology, Volume 130 Issue 12, p 1165.